The recent tragedy in Orlando should remind us, among many other things, that building solidarity and compassion across multiple identities is both difficult and necessary. It is difficult because too few people are willing or able to understand how intersecting forms of oppression can leave their mark on one’s identity. It is necessary because those forms of oppression are at their most powerful when they divide people as they hold them down. Building a politics that recognizes the unique challenges of intersecting identities while not stopping at advocating for the freedom of only that identity is the sort of critique that reminds us that organizations like The Human Rights Campaign are both a force for progressive change but ultimately an extremely limited one. I like to think of concepts like identity politics and intersectionality as inventions or technologies because it underscores how analytical concepts do work in the world. You can look at writing by radical collectives before and after these concepts were invented and see very different kinds of points being made and new approaches to activist work being tested. Thinking this way also helps us think about how and to what degree people use these concepts correctly or productively. The Combahee River Collective started out as a chapter of the National Black Feminist Organization but eventually became a black feminist lesbian organization of its own operating out of Boston in the second half of the 1970s. The term “identity politics” was first coined in their collective statement released in 1977 which was consciously part of building a movement around intersecting forms of oppression. In the interview below, between author and black feminist Kimberly Springer and Combahee River Collective member Barbara Smith, we can see how identity politics and intersectionality were “invented” for a very particular purpose but then appropriated by the right wing to do the exact opposite kind of rhetorical work. After so much abuse, these terms get “watered down” even when they’re used by well-intentioned leftists. 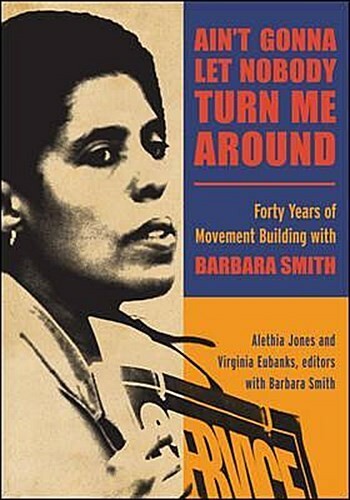 The following is excerpted from pages 53 and 54 in Ain’t Gonna Let Nobody Turn Me Around: Forty Years of Movement Building with Barbara Smith (2014). Barbara Smith: We meant to assert that it is legitimate to look at the elements of a combined identity that included affiliation or connection to several marginalized groups in this society. There is meaning in being not solely a person of color, not solely Black, not solely female, not solely lesbian, not solely working class or poor. There is a new constellation of meaning when those identities are combined. That’s what we were trying to say. … Black politics at the time, as defined by males, did not completely or sufficiently address the actual circumstances of real, live Black women. They just didn’t. Kimberly Springer: But it seems like there are some on the left who might let the Right co-opt the term “identity politics” by talking about the differences that they think identity politics creates. It seems like the disparagement of identity politics is something that works against having unity within a movement. So, if people are organizing that there’s value in their own situation and their own identity, how does that work with the goal of solidarity? Barbara Smith: That was another aspect of it Because the watered-down version of identity politics was just what you described. Which was, “I’m an African American, working-class lesbian with a physical disability and those are the only things I’m concerned about. I’m not really interested in finding out about the struggles of Chicano farm workers to organize labor unions, because that doesn’t have anything to do with me.” The narrow watered-down dilution of the most expansive meaning of the term “identity politics” was used by people as a way of isolating themselves, and not working in coalition, and not being concerned about overarching systems of institutionalized oppression. That was narrow.